The all-new Topwater series offers large fishing kayak performance in a compact, lightweight package. A marriage of stability and performance, the Topwater, with the all-new ultra-stable DoubleU Hull, quietly glides through any water condition while providing a stable, comfortable stand-up fishing platform. The new breathable ElementAir seat has high/low position options and offers unmatched comfort for this price. The Topwater is the first and only Old Town boat to feature the revolutionary universal transducer mounting system to make mounting your transducer easier than ever. It also features an oversized stern tankwell, impressive hull capacity of 500 lbs, multi-position rod holders, and onboard rod and tackle storage. Even the saltiest of anglers will be impressed by the overall fishability of the new Topwater series. A: No, it will not. There are only three Topwater models: The 106, 120, and PDL. The 106 and 120 models do not even have a center console for mounting a pedal drive, so even if you purchased a pedal drive separately, it could not be installed. These two models are for paddling only; they also do not have a rudder. The PDL is the only Topwater model that has, and can use, a pedal drive system. The PDL model has a very similar hull design to the 106, but is actually slightly different (wider) to accommodate the PDL console. 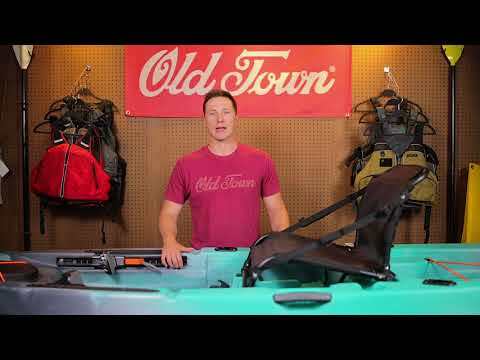 Old Town likely chose not to make the Topwater 106 and 120 models with a center consoles and upgradable to pedal drive due to their price point, and likely skipped making a 12' Topwater PDL to avoid encroaching on their Predator series of kayaks.